This is my posh version of a Twix bar. A buttery, fennel shortbread base, caramel-y medjool dates in the center and rich dark chocolate over the top. Super decadent. 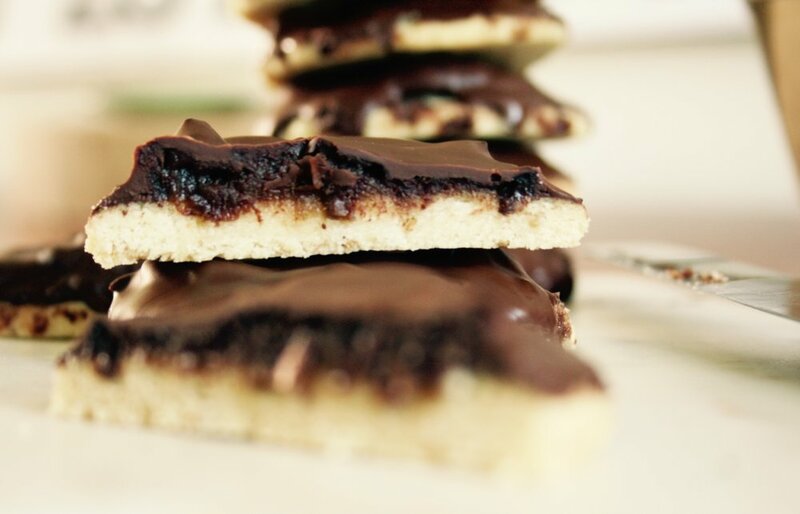 If you can’t be bothered with the cookies, make it as a slice. Just press the shortbread into a small tin and bake off. Layer the dates on top, then the chocolate. Leave it to set and cut into small squares – it will taste just as good. The shortbread recipe is from my Grandma’s cookbook, it is fragile and a little fiddly, but well worth it in the end. 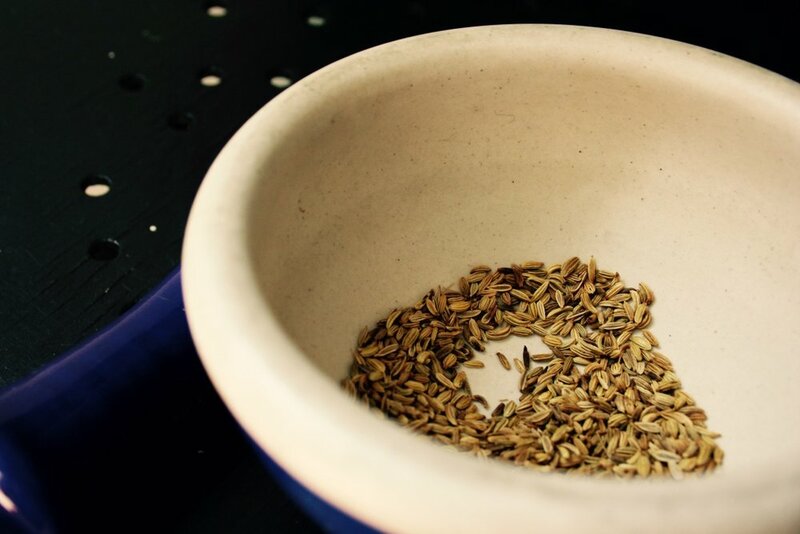 Toast fennel seeds in a small pan over a medium heat for 1-2 minutes, until they start smelling amazing. Once cooled, tip into a mortar and pestle and crush them up a little bit, but not into a powder. Preheat the oven to 150 Celsius and line two cookie tins with baking paper. Sieve flour, rice flour, sugar and salt into a large bowl then add in the butter and fennel seeds. With your fingers rub the butter into the flour mix until it looks like breadcrumbs. Then knead the mix together until it forms a dough. It is very crumbly and soft but eventually it will come together so keep persevering. Once it forms a smooth ball, lightly flour your bench and gently roll the dough out, not too thin or it will stick. With a small cutter cut approximately 10 biscuit rounds out. Using a butter knife gently slide the rounds onto the cookie tin. Work the leftover dough back into a ball and roll out again. I got 6 cookies the second time around. Prick each cookies a few times with a fork and bake for 25 minutes. Cookies should be pale or just slightly beginning to brown on the edges. While they’re cooking, make the date paste. Take the stones out of the dates and add them to a small saucepan with half a cup of water and vanilla. Bring them to a simmer and cook with the lid on for about 10-15 minutes. Check the dates every few minutes making sure they don’t stick. Separate them with a fork and mash them up while they’re cooking. 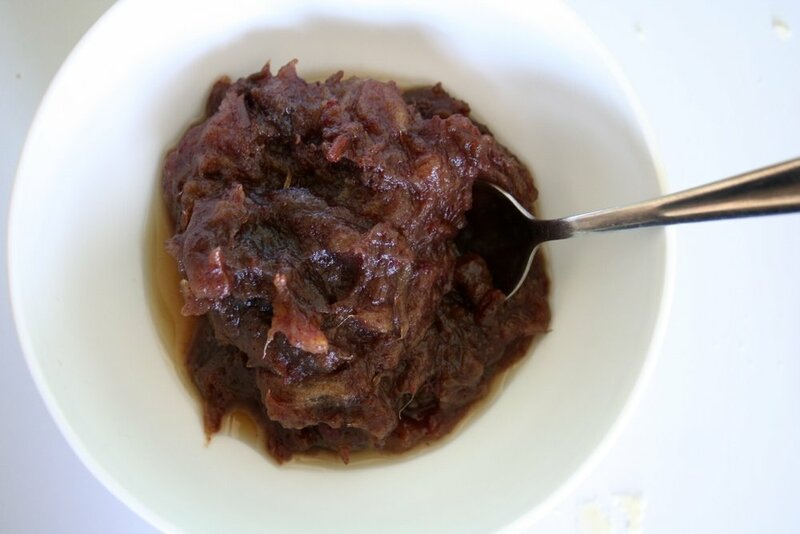 Once the dates have absorbed all the water and broken down into a paste they’re ready – leave them aside to cool. You could blitz them at this stage for a really smooth paste, but I prefer them slightly chunky. When the cookies are ready, take them out of the oven and leave them for 10 minutes in the tin – they’re really fragile. Once you can handle them leave them to cool on a wire rack. 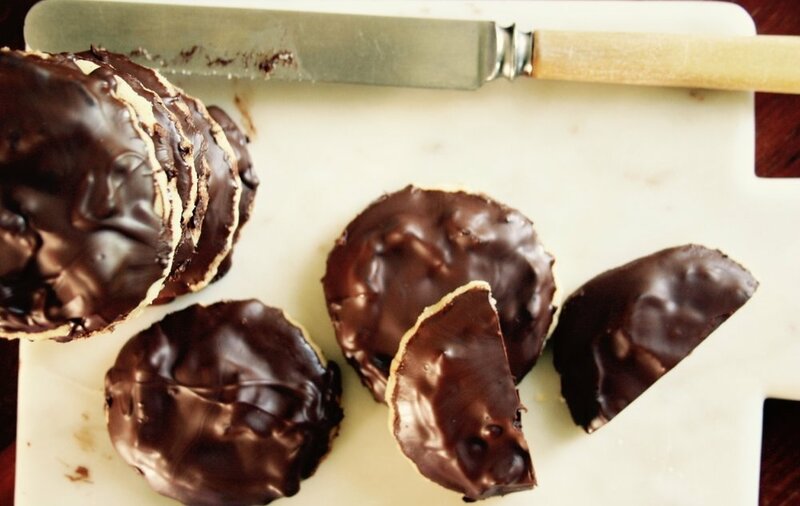 Put a teaspoon of date paste onto each cookie, smooth it over the top but leave a border around the biscuit so it’s easy to pick up. Then dip the top of each cookie in the chocolate and leave to set on the wire rack. Use leftover chocolate to drizzle over any bits you’ve missed. Leave to set, or don’t leave to set, and eat with a giant cup of tea or glass of milk.